Warburg Realty, one of Manhattan’s oldest residential brokerages, is getting in the smartphone and tablet game, partnering with StreetEasy to launch a mobile app that provides up-to-date information on the firm’s exclusives, company executives told The Real Deal exclusively. 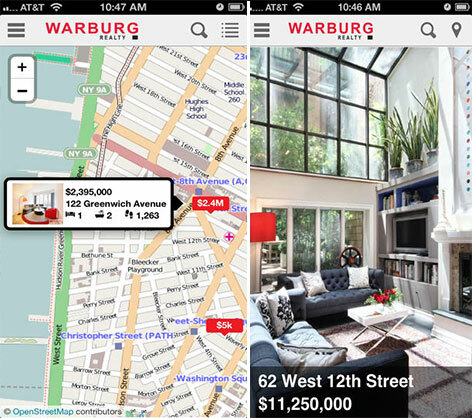 The free app, which debuted today, is available on the iPhone, iPad and Android devices, and allows users to access Warburg’s listings, photos and floor plans. StreetEasy provides additional building information, and users can link to the listings provider for more details. Warburg is the latest of several city brokerages to launch mobile apps in recent years, include the Corcoran Group, Sotheby’s International Real Estate and CitiHabitats. In addition, the app’s “My Warburg” tool provides current Warburg sellers with real time updates on a property’s marketing activities and performance. Sellers can see, for example, where their property has been marketed in print media, how many hits it’s had on Warburg’s web page and how many times it’s been emailed to other people, Peters added. This tool has always been available on Warburg’s website. The app is also a way to pick up more clients, Peters acknowledged. “Anything which moves you ahead helps your position in marketing,” he said. In the fourth quarter of this year, Warburg Mobile will launch access to the social media site Foursquare and WalkScore, which shows how “walkable” a property is in relation to popular neighborhood destinations. “I’m completely psyched about” the app, Peters added. StreetEasy recently made headlines when it was acquired by Zillow for $50 million, as previously reported. Warburg was ranked the second largest mid-size firm by The Real Deal in May. At that time, the 107-year-old brokerage had 126 agents and 53 active Manhattan listings worth $188.1 million.